A Hallmark guarantees the quality of the metal you are buying by showing that the item has been independently tested and is one of the legally allowed qualities for a jeweller to sell to you in the UK. Most items should be hallmarked although some items below a certain weight or that are very delicate may not need to be hallmarked so if we sell an item without a Hallmark, that is because it does not have to have one. If you click on the link below, it will take you to Birmingham Assay Office who are one of four UK Assay offices that hallmark items and this will explain the law in detail to you. Alternatively, contact us for more information or call into either of our shops for a full explanation. John Pass Jewellers in Crewe and Newcastle Under Lyme sell a fantastic range of affordable and luxury Diamond set jewellery and are can also get loose diamonds which we can make up to a design of your choice. To help with your choice, the GIA (Gemmological Institute of America) invented a comparison system to allow you to know the differences between stones. This is called the 4 C’s. Colour - The letters D to Z are used to indicate colour. D is the whitest gem and Z has a definite colour tint. Stones with a definite colours such as Red, Blue or Yellow are classified separately and are known as fancies. Clarity - Many diamonds have natural marks known as inclusions inside them. The GIA scale starts as F which means a flawless stone with no inclusions in and goes to I which means inclusions are visible with the naked eye. Many of the stones John Pass sells are VS to SI quality which are Very Small or Small Inclusions that you would need 10 x magnification to see. Cut - The angles on a diamond, known as facets, reflect light back to the eye. The better a stone is cut, the more it will show the unique play of colours, known as fire, within the stone. The quality of the cut is assessed by the GIA to show you how it has been cut. There are also different shapes of stone within each type of cut. Why not call into John Pass in Crewe or Newcastle Under Lyme so we can show you some diamonds and you can see the differences for yourself. Carat - Diamonds are weighed in Carats. One Carat is 0.20 grammes. It is not always the case that a diamond with a higher carat weight will be more expensive. You have to take into account the Colour, Clarity and Cut explained above to see how your diamond's price has been assessed. 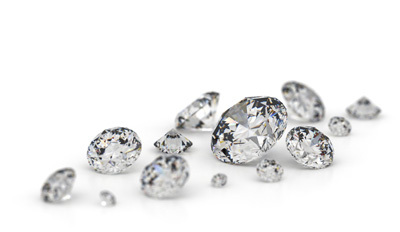 At John Pass our qualified team can tell you everything you would like to know about diamonds. Try us when you next want to make a diamond purchase in Staffordshire, Cheshire and surrounding areas. Visit www.gia.edu/diamond/buyers-guide for more information about diamond quality.